... get in touch to discuss any ideas you may have! Click on the image for a full size version. 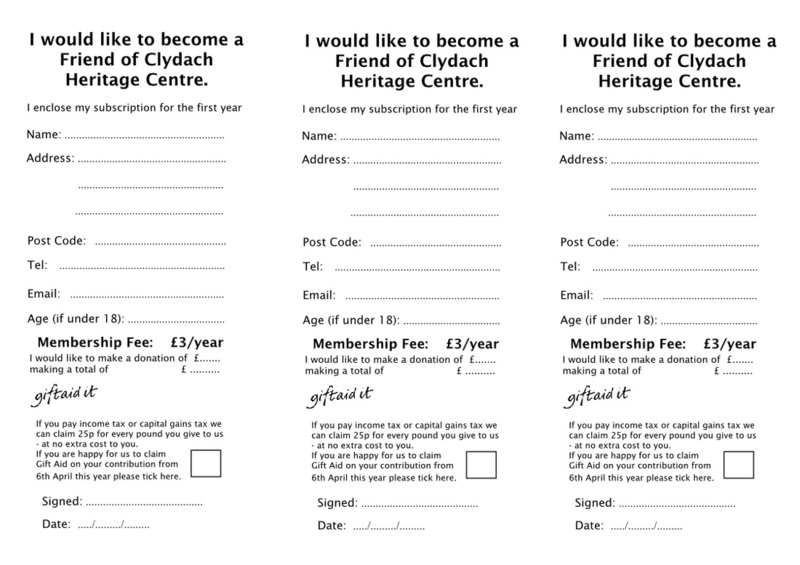 The three forms fit neatly on an A4 sheet; persuade some of your friends to join as well and make full use of your page! Thank you. The more staff we have the more often we can open! Whether it's 10minutes of Social Media assistance each week, or 2hrs of your time now & again to help staff the Centre of a weekend - your help is much appreciated & needed!! We rely on volunteers for the staffing of the Centre; the more we have the more often we can open. Could you spare a few hours a month to help staff the Centre? If so please get in touch with the rota organiser Sue Evans by ringing the number above and leaving a message or use the 'contact us' email form. Supporting use could be as simple as sharing any ideas you may have with us! 5. Raise money for our Not-for-profit Centre (or Donate).